Use cursor keys and mouse to fill the screen with bullets in this platform-shoot-em-up. Collect as many of the blue power-ups as you can to upgrade your puny starting gun into a harm-producing device of chaos. Double jump if you need to, and press down to reload in quiet moments. After the success of the first Iron Maiden game we built, EMI comissioned a second. This is the result – a fast paced platform shoot-em-up. I had a specific goal in mind from the start, and that was to make it as over-the-top as possible. I wanted to be able to upgrade the gun tens of levels so that it goes from a weedy pop-gun to a bullet spitting death dealing mayhem device. I achieved that, but somehow a screenful of bullets still wasn’t quite as satisfying as I’d wanted. The solution was a mega-powerup that gives you all the max gun settings, at double the firing rate and with a rose-tinted death-glow over everything. That works quite well! I think one reason the gun isn’t quite as satisfying as I’d wanted is simply that it doesn’t make much noise. We tried out various sound effects, and none really fitted. Plus, they dominated the sound-stage completely since you’re pretty much firing the entire time you’re playing. The platforming element works remarkably well for the simplicity behind the scenes. Everything is based on a simple hit-shape that defines where the ground is, and care is taken that you can’t fall so fast as to tunnel through it. The sliding trapdoors are then just animations in that hit shape. So simple! The character can climb gentle slopes and stairs, which is essential if the player isn’t to get stuck on the slightest of objects. The automatic, fixed pace level scrolling works well to keep the pressure on. It wouldn’t suit all games of course, but it serves its purpose well here. The only downside is that the character animation moonwalks a lot of the time! Baddie AI is ultra simple too. They are generated at fixed positions in the game, and follow a set path. They shoot at random, but directly towards the player. This is enough in this game’s case to produce plenty of challenge, since there’s lots going on. We struggled graphically for an explosion sequence. They always just looks pasted on top, rather than being part of the action. In the end, we settled on not having one and instead flashing the baddies brightly for a second and making them fall apart. The result works well! 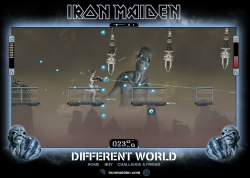 Whilst this game was well received, it wasn’t anything like as widely played as the first Iron Maiden game we built. I never quite understood why, but very few portals seemed to pick up on it. I don’t think it was seeded any differently to the other game. It was still a success, but nothing like as strong as A Matter of Life and Death. Don’t force your character to stop shooting back whilst he’s taking damage!